What is Hawaii State FCU? We are your financial institution. Here you can count on banking, money smarts and a community that cares. Over the decades, we’ve helped countless families. That’s because we offer better rates on loans and savings, as well as low to no fees on the products and services you need. Get more from your money with free checking, affordable loans, low fees and more. Learn to read your credit report, improve it and boost your financial wellness. We care about the community and the people you know and love. Monday to Friday from 7:30 a.m. to 7:00 p.m.
Saturday from 9:00 a.m. to 5:00 p.m.
Any Employee or Member of a Select Employment Group (SEG) which includes companies, associational and non-profit groups located in the State of Hawaii and enrolled with Hawaii State FCU. Together we’ll help you realize your hopes and dreams, whether that’s buying a new home, financing a car or starting a business. At Hawaii State FCU, you make it all possible. We’re a family that cares for its own, including you. Get quick and convenience access to your money with unlimited surcharge-free ATM transactions at all Hawaii State FCU and Bank of Hawaii ATMs. Get more from your checking account, including the chance to earn interest and rewards points. Enjoy no loan or application fees and loan terms of up to 84 months. All of our profits go back to you in the form of better rates, lower fees and innovative services. We are part of the Shared Branching Network, which means you can access your money at other Hawaii credit unions. Or at 5,000+ locations throughout the U.S.
From pre-qualification to closing, we’ll be with you every step of the way. Pay bills, transfer funds, deposit checks and more. Your time is valuable. Online Banking and our Mobile App Suite are designed for your busy life. Understand what is in your credit report and how to improve your score. Sign up for a free, 1-hour Financial Education Seminar. Or start right now with our eLearning Modules. We can help you identify your needs, develop a plan and provide ongoing consultation. We’ve partnered with Farmers Auto Insurance and TruStageTM Insurance to help you protect your family and your future. You could earn $100 for every line you switch to Sprint®. Simply tell them you’re a Hawaii State FCU member. Whether it’s hosting our family-friendly movie days or participating with Friends of the Library of Hawaii, we love every occasion we have to interact with members in and out of the credit union. Hawaii State FCU recognizes and appreciates the extraordinary effort and sacrifices that Hawaii public school teachers provide to our community through the Investing in Education Grant Program. Hawaii State FCU provides scholarship opportunities to its members attending a university, college or trade/vocational school. Since 1996, the Lowell Kalapa Scholarship Program has awarded more than a half million dollars to help students pursue higher education. We know happy employees lead to happy members, and that’s why we strive to be one of the best employers in Hawaii. We’ve been recognized as a Hawaii Business Magazine “Best Place to Work” consistently throughout the years. We'll always do right by you. 1. Ten (10) posted net purchase transactions with a HSFCU debit card within 30 days of checking account opening are required to qualify. 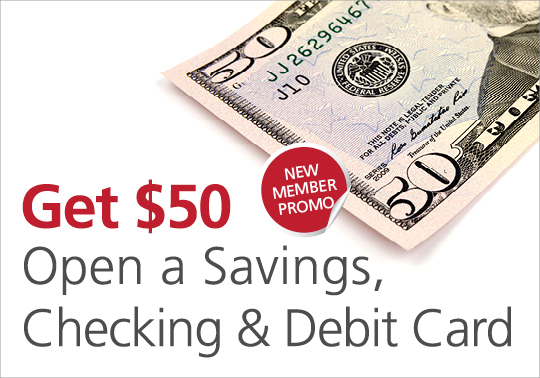 Or open a new checking account with a direct deposit within 60 days of account opening. Annual percentage yields as of 10/1/2018, are as follows: Regular Savings: 0.10%, Simple Checking: 0.00%, Dividend Checking: 0.05%, Relationship Checking: 0.05% for balances up to $9,999.99, 0.05% for balances $10,000 to $24,999.99, 0.10% for balances $25,000 to $49,999.99 and 0.15% for balances $50,000+. 3. Available only for Android™, iPhone® and iPad® devices. iPhone® and iPad® is a trademark of Apple® Inc., registered in the U.S. and other countries. App Store is a service mark of Apple Inc. Android is a trademark of Google Inc. Standard messaging and data usage fees apply. Please contact your carrier for details.